The tendency of trucking companies to flout the law by employing only foreign nationals as drivers was one of the reasons causing tensions that led to violent protests, Transport Minister Blade Nzimande said. Briefing the media in Durban following a meeting between South African truck drivers and government leaders in Durban, Nzimande said local drivers who are not happy with the employment of foreign national drivers were not xenophobic. “A preliminary investigation by the Department of Labour found that in some companies 100% of truck drivers are foreign nationals — we simply can’t allow that to continue. “When local truck drivers raise these issues it is not because they are xenophobic. They feel that there are enough drivers in the country who can do the jobs which these foreign national drivers are doing,” he said. The meeting took place following violent protests across the country that saw trucks being torched and roads blocked for several hours. Two weeks ago the N3 freeway at Mooi River had to be closed for an entire day following violent protests by people claiming to be local truck drivers disgruntled over the employment of foreign nationals as drivers in the industry. A governmental task team comprising officials from the Transport, Home Affairs and Labour departments has since been established to deal with the unrest. Nzimande said it had been agreed that raids should be conducted at the premises of truck companies suspected of flouting the country’s labour laws. “There are processes that should be followed when employing foreign nationals. We will be conducting unannounced visits to the premises of these truck companies to check if the law is being complied with,” Nzimande said. Speaking at the same press briefing, All Truck Drivers Foundation (ATDF) chairperson Sipho Zungu said while local truck drivers where happy that the government was finally doing something about their plight, they were not impressed with the slow pace at which government was moving. “Our view is that government processes are too slow. As we speak, our members are being fired for no reason and then replaced by foreign national drivers. Drivers in this country are desperate,” he said. On the violent protests that had been happening across the country, Zungu said truck drivers were not part of these. “We have been engaging in peaceful protests to highlight our plight but what then happened is that people who are not truck drivers did certain things such as the burning of trucks. We don’t know who those people are,” he said. 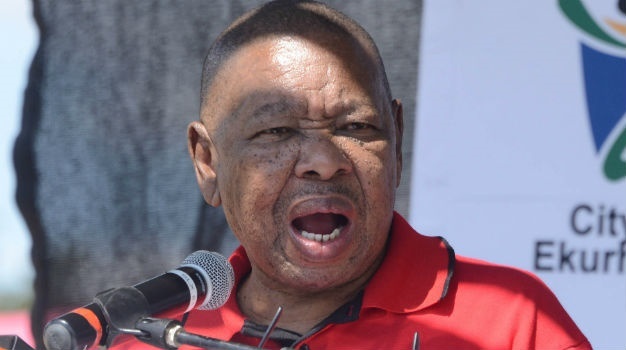 While Nzimande said government regarded the issue of truck drivers as a priority, he admitted that addressing the problem would not be simple. “The challenge we have is much broader — we have to accept the reality that many foreign nationals end up entering our country because of the bad economic situation in their own countries. The fact of the matter is that the economic situation in most of our neighbouring countries such as Zimbabwe is quite bad. “What we are dealing with here is a manifestation of a bigger problem,” he said.